Yes, we still need more doctors. 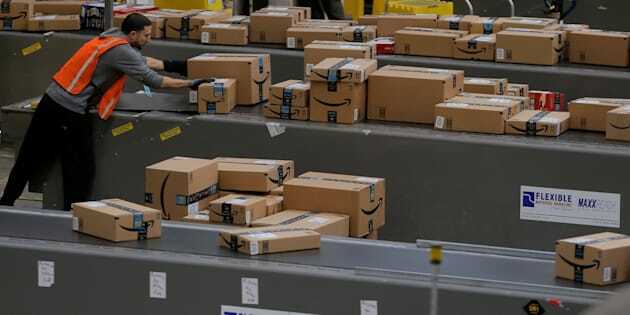 A worker prepares packages to be shipped inside of an Amazon fulfillment center in Robbinsville, N.J., Nov. 27, 2017. Canada's job market is on fire, as the unemployment rate reached a new low in December. But for those still looking, there are a few positions to keep an eye out for. Economist Daniel Culbertson of job site Indeed.com said the outlook for 2018 "is rather bright." "These roles are becoming more vital to the Canadian economy as e-commerce continues to grow, new technologies change the tech-world, and demographic trends fuel healthcare demand," Culbertson said in a release. Here are Indeed.com's five jobs to watch in 2018. With more and more Canadians choosing to shop from the comfort of their own homes, Indeed reported an over 600-per-cent increase in job postings for workers to fulfill customer orders in 2017. Prime Minister Justin Trudeau (R) talks to employees as he tours Kinova Robotics, a company that designs and manufactures robotic arms, in Boisbriand, Que. March 24, 2017. Opportunities for machine learning engineers grew by 150 per cent in 2017, as advancements in artificial intelligence technology created a need for more high-skilled jobs. It's no surprise that Canada's aging population is expected to put a greater strain on provincial healthcare systems, and that developments in healthcare technology and improved diet and living conditions means these Canadians will live longer. Indeed reported that demand for family medicine physicians increased by 138 per cent in 2017. A worker checks welded part from auto weld assembly line at Alfield Industries, a subsidiary of Martinrea, one of three global auto parts makers in Canada, in Vaughan, Ont. April 28, 2017. Indeed saw a 45-per-cent increase in manufacturing technician jobs in 2017. As NAFTA decisions loom in 2018, this could be a sector to watch. The booming tech industry's demand for full-stack developers, coders, and everything in between creates a need for human resources professionals who can match those job-seekers to potential employers. Indeed saw a 25-per-cent increase in postings for tech recruiters 2017, and expects that number to grow in 2018.